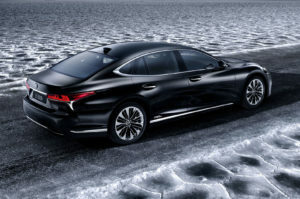 The 2018 Lexus LS 500h was released at the Geneva Auto Show. The LS 500h will be powered by a 3.5L V6 engine with 2 electric motors. The combined horsepower will be 354hp. The LS 500h uses Lexus' Multi Stage Hybrid System, which is also used on the all new LC. According to Lexus, the interior was inspired by Omotenashi, which is the Japanese concept of hospitality. This is seen the craftsmanship of the interior as well as the comfort of the seating.